Giovanni Visconti (Movistar) took a solo win in Sunday’s show-shortened stage 15 of the Giro d’Italia on the Col du Galibier. Carlos Betancur (Ag2r) placed second, with Przemyslaw Niemiec (Lampre-Merida) in third. Race leader Vincenzo Nibali (Astana) came in with a compact group of overall favouries to maintain his advantage at the top of the general classification. He leads Cadel Evans (BMC Racing) by one minute and 26 seconds, and Rigoberto Uran (Sky) by 2-46. 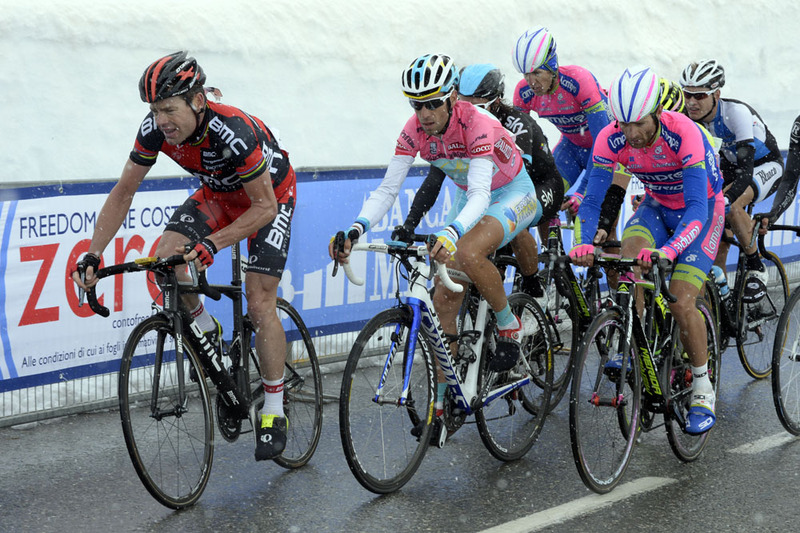 Race organiser RCS Sport took the decision to shorten the stage by just over four kilometres due to the depth of snow and road conditions at the top of the Galibier. The stage finished in Les Granges du Galibier – Monument Pantani. After the previous day’s attrocious racing conditions, the riders also decided that they would neutralise racing over the initial categorised climb to Col du Mont Cenis. Stefano Pirazzi (Bardiani Valvole) and Robinson Chalapud (Colombia) kicked out near the summit to collect the KoM points on offer, and the racing recommenced. Giovanni Visconti (Movistar), Pieter Weening (Orica-GreenEdge) and Matteo Rabottini (Vini Fantini) then bridged over to Pirazzi. Visconti attacked his escape companions on the descent and rode clear to crest the Col du Telegraphe solo. A small group of five riders launched an attack on the Telegraphe, comprising Robert Gesink (Blanco), Robert Kiserlovski (RadioShack-Leopard), Sergio Henao (Sky), Egoi Martinez (Euskaltel-Euskadi) and Francis De Greef (Lotto-Belisol). Gesink, Kiserlovski and Henao posed a danger to the overall classification, and several teams took up the pace-setting of the peloton to eventually chase them down. 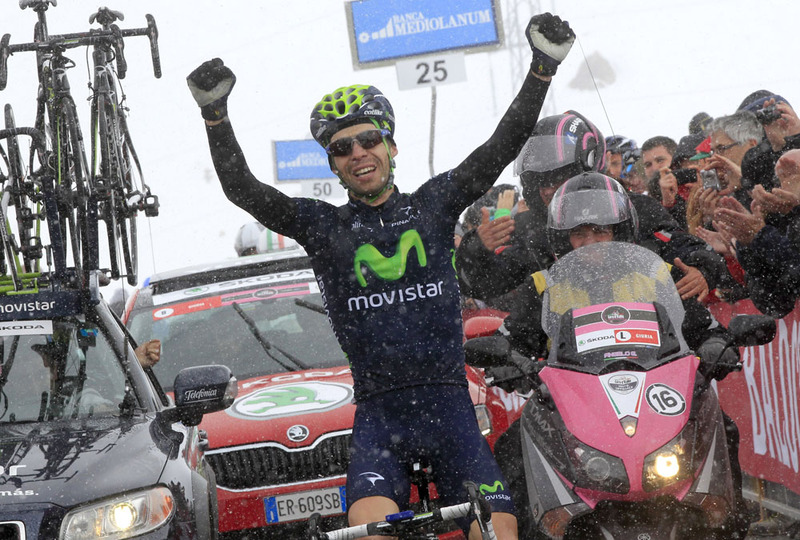 Meanwhile, Visconti pressed on up the Galibier as snow started to fall heavily. Rabottini rode away from Weening and Pirazzi to try and chase down the Movistar rider up front but couldn’t match his pace and all three were eventually caught by the contenders group. Nibali accelerated in the last two kilometres, splintering the lead group but was swiftly caught by a selection containing Uran, Michele Scarponi (Lampre-Merida) and Evans. Betancur, Niemiec, Fabio Duarte (Colombia) and Rafal Majka (Saxo-Tinkoff) attacked with the last kilometre with Betancur snatching the lead in the young riders competition from Majka thanks to his bonus time for coming second. Betancur also moved up to seventh overall. 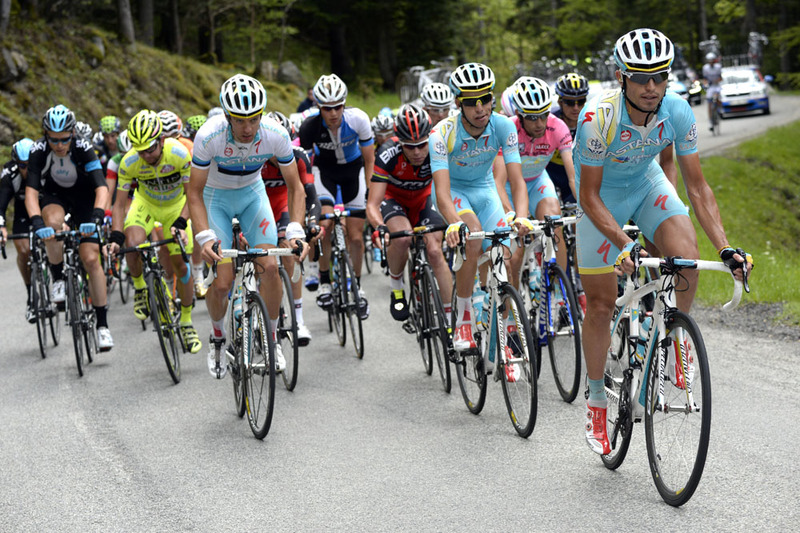 Scarponi led home the contenders group, who were content to come in together safe in the knowledge that another stage had been survived in a race that continues to be heavily affected by the adverse weather. All four British riders left in the race – Mark Cavendish (Omega Pharma-QuickStep), Steve Cummings, Adam Blythe (Both BMC) and Alex Dowsett (Movistar) finished in a large group that came in 27 minutes and 54 seconds behind stage winner Visconti.